In the early days, phone lines were the only connection used to access the World Wide Web. Now that technology has advanced rapidly, we are presented with more and better choices for connecting. 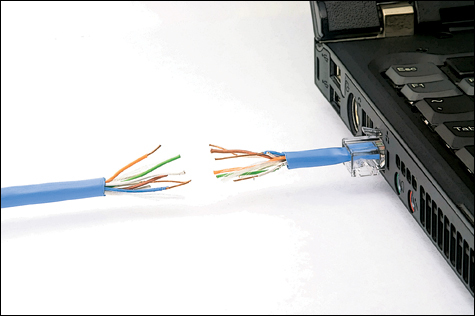 Aside from dial-up, we can use broadband connections through DSL, ADSL, or wireless. Unlike dial-up, which has a bitrate of 56 kilobits per second or even less, broadband offers a faster Internet access with 64 kilobits per second up to 2.0 megabits per second. Just like dial-up, both DSL and ADSL connections make use of the phone line to send packets of data. However, the phone’s signal is not affected because a Digital Subscriber Line uses a digital frequency that is different from the analog signals telephones and fax machines use. This allows a subscriber to use the phone and surf the net at the same time. If today’s connections are faster, are they also stable? Unfortunately, having a faster connection can not ensure a stable one. When a connection speed is promised at 1 mb per second, and only half of that is being delivered, then the problem is not your router or your modem, but your Internet Service Provider (ISP). Why is this? For us to understand why we don’t always receive the same bitrate, we must remember that the flow of data with digital signals does not work like a ray of light, which is constant and static. It is normal for digital signals to fluctuate in a day. There are times that the signal may be affected by environmental factors, such as rain or wind. The electrostatic discharge from lightning will negatively affect both the Internet connection signal and the computer’s motherboard and power supply. So what can cause my Internet connection to suddenly disconnect? There are many factors that can suddenly drop your connection to zero, or slow it down to a crawl. One major factor is surely your ISP’s facilities. As providers, they have the responsibility to make sure they provide the best possible service to paying customers. One way of ensuring this is to build better, stronger, and more advanced facilities that can handle large packets of data in faster bitrates. Another factor that will certainly affect your Internet connection is the type of hardware you use and how compatible it is with the network. When setting up a network, a technician needs to use compatible network interface cards and routers. The most common NIC is Ethernet or the IEEE 802.3 and the routers that match with it may be either wired or wireless. When encountering a connection problem, you must check first the strength of your local connection. Look at your computer’s local area connection status by double-clicking the computer icon in your notification area (usually on the right where the clock is found). From there, you can check the settings, repair the connection, or monitor the amounts of data packets that were being sent or received. Make sure your NIC card has no power save setting, which will temporarily disable the card in periods of inactivity. Turn that setting off by going to the Device Manager window and selecting the network adapter being used. Go to the Power Management tab and deselect the “Allow the computer to turn off this device to save power” option. You should also turn off the wake-on-LAN setting by deselecting the “Allow this device to bring the computer out of standby” option. Choosing this feature will surely drain your computer’s battery (if it is mobile) or cause your PC to periodically wake-up to refresh its network settings. When the setting changes were done, you should then check your router’s performance. Make sure the LED lights are blinking as they should be. Check how sturdy the cables were attached, and make sure the plugs are tightly pushed into their slots. When you have determined that your PC’s connection to the router is working fine, then it’s time to check how stable your router is connected with the ISP’s hub. Call the company’s hotline and ask for assistance from the technical support representative.